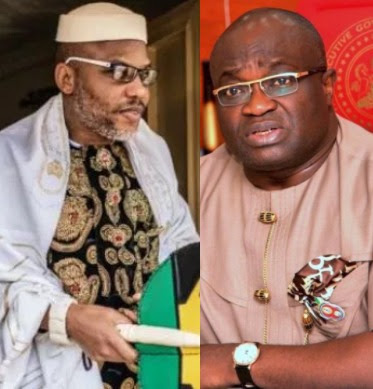 Governor Okezie Ikpeazu of Abia state says he does not know the whereabouts of the missing leader of the now-outlawed secessionist group, Indigenous People of Biafra IPOB, Nnamdi Kanu. Recall that after the September 14th 'invasion' of the Umuahia home of Kanu by military officers, his members alleged that he had gone missing. They accused the military of taking him into hostage, an allegation the military has denied. Kanu who is standing trial for treason, is expected to be in court tomorrow, October 17th, for the resumed hearing of the case. Governor Ikpeazu while speaking to newsmen in Abuja, said it would be unfair for anyone to ask him of Kanu's whereabouts. Speaking further, the governor said the people of the South-East believe in Nigeria more than any other part of the nation. “Fundamentally speaking, I think that if the question we ask in this country today about whether there are inequalities, whether there are gaps or there are people who don’t feel that they have been fairly treated either as an individual or as a family or as a geopolitical zone, the answer is yes. There is agitation in the northeast, there is an agitation in the south-west, of course there is agitation in the south-east but I dare say that there is no other ethnic group in this country that has as much faith in the Nigeria as a country, one united country than the people of the south-east, that is why they are in Sambisa. You can count how many big businesses belonging to the southwesterners that are in Aba. You can count how many big businesses belonging to the people from the northeast, north-west, north-central that you can find in Owerri. You cannot find a four-storey building belonging to somebody from the northeast anywhere in the south-east. But if you go to Kano, you don’t count three hotels before you count that of somebody from the south east. What it means is that we are the people that have demonstrated faith in the united Nigeria'.